25 sheet packGrafix Double Tack Archival Sheets. 24 x 36 inches sheet. Double Tack 2 sided adhesive film is great for mounting photos, artwork and more! Acid free and archival, safe for your most precious photos and memorabilia. This is a particularly useful and unique product. 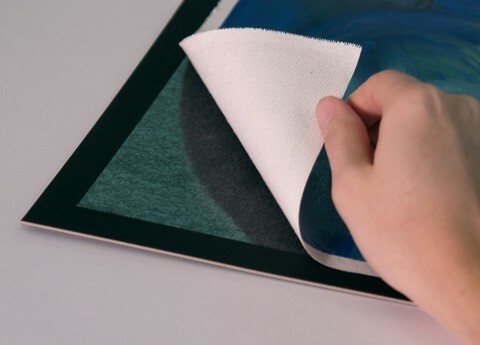 Archival adhesives are rare to come by and this is an adhesive solution that eliminates problems with spraying or using wet glues so that even thin paper does not buckle when adhesive is applied. The sheets can be cut to custom shapes and sizes. What surfaces work best with Double Tack Film? Double-Tack adheres to most smooth, flat, clean surfaces such as paper, wood, metal, plastic and glass. Double-Tack is made to be a general purpose, in-door adhesive system. The smoother the surface, the better it’s going to work. Is 2 side Double Tack® adhesive film suitable for outdoor use? No, Grafix Double Tack is not made to be used outside because if exposed to UV light and moisture over time, the film’s adhesive layer will lose its adhesive strength. If you need to use this material outside, it must be contained in something else that will keep it from being exposed to UV and moisture.